As all of you know who read this page it’s the hardest thing in the magazine for me, this one doubly so because this is a subject that means a great deal to me. I will admit immediately that I am biased; my father’s experiences with the aircraft fill my earliest memories, his tales instilling me with Shackleton lore even before I could read the aircraft’s history for myself. I could have filled the next 130 pages with just the stories I know about the aircraft, but that would have missed the point. What I have tried to do instead is capture the essence, the myth of the beast through a combination of the background history of the companies and people behind her, interspersed with the words of those who knew her best. There are those purists who will wonder why I did not mention the proposed Napier Nomad powered Shackleton MR Mk.4 and 5 in these pages. Firstly, these were never completed and the truth is, without the Griffon, these would have been a different aircraft in more than just engine, not really Shackletons at all. In researching this issue, I think I have finally understood the hold she has over everyone who ever came into contact with her and can distil this into three points. The first point of this understanding is right there in the last sentence. I know I am not supposed to anthropomorphise a machine and should refer to the Shackleton as it, not her, but not this time, sorry. This was most definitely a her, not an it; a character with quirks and foibles unique to each airframe. Some were reliable joys, others oil stained sorrows, but all were gracious and well behaved in the air, a Lady indeed. So that’s the first thing. 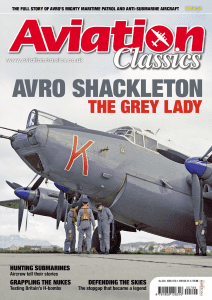 Only 185 Avro Shackletons of all versions were built, a surprisingly small number considering the worldwide community of passionate enthusiasts of the Grey Lady. The following is so strong they even have their own dedicated organisation, the Shackleton Association. Many of the members are ex-Shackleton air and ground crew it is true, but there are just as many, like myself, who find the aircraft irresistible, representing as it does a bridge between piston and jet, between growl and howl. 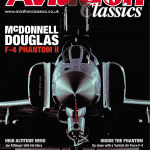 Inside this community the truth of the difficulties of maintaining and operating the Shackleton are discussed openly, but woe betide any outsider who dares to pass a derogatory comment about the aircraft. Even today, there is a fierce loyalty to the Growler, another of many nicknames for the type. That’s the second thing about the Shackleton legend, the quality of the people. Long range maritime operations called for teamwork, self sufficiency and a degree of cooperation and co-dependence that is no longer occasioned by modern equipment to anywhere near the same degree. The difficulties these air and ground crews faced every day, firstly in the job they had to do, and secondly in the equipment they had to do it with, built a durable and lasting esprit de corps. Single crews or flights could be detached to some godforsaken backwater for months at a time with limited or no supply lines. Often, all they had was each other, their aircraft and the greatest weapon of the ‘kipper fleet’ as they were collectively known, their irrepressible sense of humour. One thing that comes across very strongly in some of the stories is an almost perverse pride; despite the difficulties, despite the equipment problems, despite the sneers of crews on more modern types, Shackletons got the toughest jobs done, and done well. 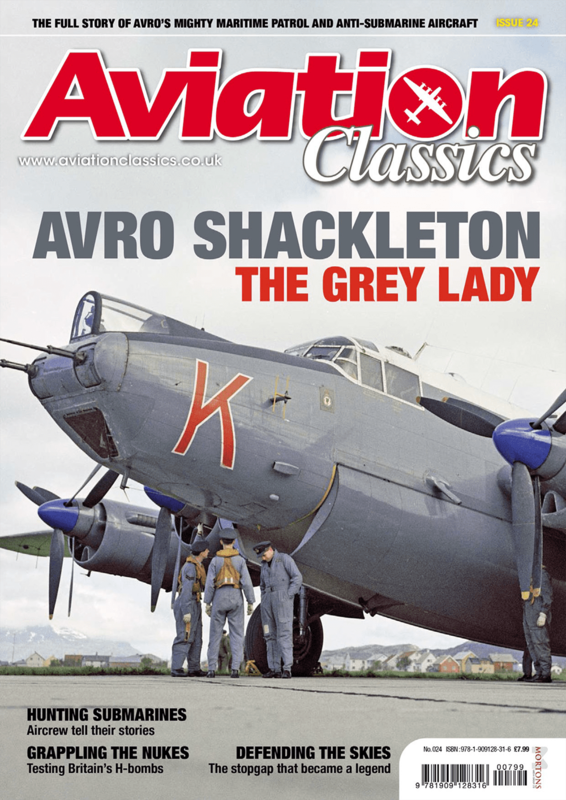 Given these circumstances, and that the Shackleton proved adaptable to roles beyond the designer’s wildest dreams, is their camaraderie in the face of adversity and pride in their achievements any wonder? 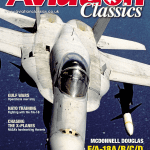 During 40 years of front line service the Shackletons soldiered on throughout the Cold War right up to the 1990s, a testament to the tough and durable nature of the airframe. That they did so in a role unforeseen by their designers is proof of their sheer adaptability. However, both of these attributes can be said of other aircraft, such as the DC-3 and the C-130 for example, so the Shackleton is by no means unique in this regard. What did make her unique is that she was the last of a breed in so many ways. The last piston engined maritime patrol and anti-submarine aircraft with the last of the big Rolls-Royce piston engines. The MR Mk.3 was the last dual propulsion aircraft in RAF service; the last type built with the Avro centre section with internal spars; the last multi-engined aircraft with a tailwheel undercarriage; the last RAF aircraft with a full galley that could serve fresh cooked hot meals; the last combat aircraft with padded leather chairs with ashtrays in the arm rests in the crew positions and full length bunks in a rest area. The crews were also among the last of their specialisations in the RAF, wireless operators, gunners, signallers, observers and fully equipped flight engineers who had the reputation of being able to fix anything on the aircraft. She really was the end of an era, which I believe is the third point of the legend. With her passing the world of aviation never smelled quite as right, had quite enough oil stains in it, or was ever quite so noisy again. In telling this remarkable tale I would like to record my thanks to the Shackleton Association for its assistance, particularly to Peter Dunn and everyone who allowed their words to be used to illustrate the many facets of the Grey Lady’s character. Constance Redgrave gave up an entire day to crawl into the smallest spaces in Shackletons, only to emerge, grinning appreciatively, with: “It smells good in there! Leather and airplane!” I would also like to thank my father for his support and patience with a young aircraft enthusiast full of never ending questions, and for introducing me to the other lady in his life, the aromatic, anachronistic, astounding, Shackleton.